Civil War engulfs the galaxy. The Empire rules over thousands of star systems using its military might and the power of fear. Struggling against all odds, soldiers and spies, mechanics and medics, aces and ambassadors all fight to bring freedom to the galaxy. 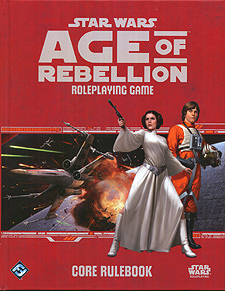 Join the Rebellion and embark on your own adventures in the Star Wars galaxy with the Star Wars: Age of Rebellion Roleplaying Game. This complete tabletop roleplaying game dives into the conflict between the Rebel Alliance and the evil Galactic Empire. Face down legions of stormtroopers, steal secret plans and restricted codes, and stay on target in the fight against the ultimate power in the universe. Full rules for playing six careers, twenty specialisations and eight species, enabling flexible character creation and development. Starship combat, customisable equipment, Force powers, dangerous adversaries, and much, much more!